The South Bronx is an area of the New York City. The area saw a sharp decline in population, livable housing and quality of life in the late 1960s and the 1970s  contributing to its negative image. The Bronx is divided by the Bronx River which has been greatly impacted by industrial and residential wastes since the 1800s. Recent information has shown that every weekday, 15,000 trucks pass through the South Bronx neighborhood (and produce toxic air pollution) on their way to and from the world’s largest food distribution centers. Facilities in the South Bronx also handle 100% of the waste produced in the Bronx and 23% of all of the city’s commercial waste. Additionally, local air pollution is worsened by emissions from the four power plants in the area . There has been increasing concern, activism and action surrounding the environmental burdens faced by this community. The movement gained strength and numbers in the 1990s  and has grown to see many positive changes in the area, notably an increase in the amount of greenspace and parks to support healthier lifestyles and environments. South Bronx’s industrial past has resulted in the area having some of the highest asthma rates in the country, and rates of death from asthma are about three times the national average. This community also suffers from elevated obesity rates and is an acknowledged food desert, meaning access to healthy food is very limited . According to Congressman Serrano, air quality is the number one environmental justice crisis faced by his constituents in the South Bronx. This issue is perpetuated by numerous highways and expressways, a disproportionate burden of waste transfer stations and the largest sewage-to-fertilizer plant in the urban area . The Congressman has worked hard to address these issues, filing a Title 6 EJ complaint in 1997, generating data to support his complaints, and promoting projects that bring people together as well as supporting community visions such as the South Bronx Greenway. 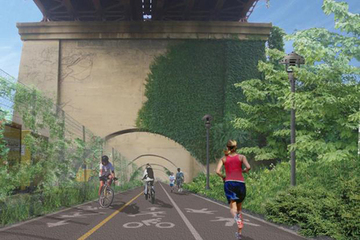 The South Bronx Greenway is part of a 23-mile-long full trail and park system called the Bronx River Greenway which connects many neighborhoods to their immediate waterfront, making ecological and historical areas more accessible. The Bronx River Alliance, along with numerous other groups, is seeking to link the northern and southern parts of the River , ensuring that the Greenway project is finished by 2020 and that residents in the South Bronx enjoy the benefits of the paths, parks and waterway access. Allowing bike and pedestrian traffic, the greenway will develop new open space in neighborhoods severely lacking it and restore existing parks. Creating waterfronts and other public spaces that are safe for cyclers and pedestrians is particularly urgent in low-income communities, such as the South Bronx, who are resisting the imposition of environmentally burdensome land uses and infrastructure . In the South Bronx, completion of the greenway involves the development of new open space and parkland at sites which include an abandoned concrete plant, a reclaimed street end, and a long-neglected stretch of land across the river from Starlight Park. Youth Ministries for Peace and Justice has worked for years with allies throughout the South Bronx area on the Bronx River Greenway and has been particularly successful in the struggle to turn an abandoned concrete plant along the River into a city park . -	Facilities in the South Bronx also handle 100% of the waste produced in the Bronx and 23% of all of the city’s commercial waste. -	Every weekday, 15,000 trucks pass through the neighborhood – and produce toxic air pollution – on their way to and from the Hunts Point Market, one of the world’s largest food distribution centers. Other High rates of asthma and asthma-related deaths. High rates of obesity are also prevalent in this community. Why? Explain briefly. The Bronx River Greenway project has been ongoing for quite some time and has the continued support of numerous organizations and Congressman Serrano. Environmental goods are finally being brought to a community suffering many environmental burdens.